I love this book, It was so cool, it started of plainish, the intro was a pretty normal one, exept it wasn’t, It was the type of writing I would do….just a THOUSAND times better…. It drew me in and brought me into the book. Barney’s character reminds me of something, I’m not sure what, He’s kind of refelcting me and everyone else in the world, he brings out all of our flaws, yets also the good things! 7 New Non Fiction to read during the last days of spring. It’s less than three weeks till the end of spring and the beginning of summer. Pop on down to your local library and check out the latest new junior non fiction that will take you on a journey into the wonderful world of animals, fairies, Star Wars and Harry Potter. Enjoy! From blue whales to bumblebee bats and everything in between, A First Book of Animals takes you all over the planet to visit all kinds of different creatures. Check out this updated, expanded guide to a galaxy far, far away and discover a universe of information of the Star Wars galaxy, which includes brand-new material from Star Wars: The Force Awakens. With eight brand new artworks, and an incredible range of location cross-sections, illustrations, and photographs, Star Wars: Complete Locations is the essential guide for anyone wanting to find their way around the galaxy far, far away. Prepare to enter the world of Harry Potter by reading this cinematic guide which holds an outstanding collection of photographs and quotes, featuring Harry Potter, describing his life at Hogwarts, his relationships with friends and family, and his battles with Voldemort. Girl power is rolled into one with The Essential Film Companion for Hermione Granger! Throughout all eight HARRY POTTER films, Hermione shows her wisdom and daring on her adventures with best friends Harry and Ron, secretly brewing Polyjuice Potion, rescuing Sirius Black with a Time-Turner, and creating Dumbledore’s Army. Revisit these moments and more from the girl who proved that Muggle-borns can be the most skilled witches and wizards of all. Harry Potter’s sidekick, Ron Weasley finally gets his own starring role in his own Essential Film Companion! This collection of photographs and quotes from all eight HARRY POTTER films takes a closer look at Ron’s life, including his time at Hogwarts, family and friends, and dangerous battles against the Dark Lord, Voldemort. Read this book and step inside a world of magic, enchantment and mystery as you enter the realm of the fairies. A great book for girls to enjoy. This essential guide covers everything you need to know about caring for your dog and basic training techniques, with easy step-by-step instructions, from sit, down, and stay to walking to heel on the lead. 4 New Non Fiction: Heroes and Wizards vs Zombies and Monsters. Beastworld: Terrifying Monsters and Mythical Beasts. Step into a spine-chilling world of terrifying mythical beasts from ancient myths, strange sightings and folklore. Mythical beasts includes Bigfoot, the Loch ness monster and the kraken. Harry Potter: The Character Vault. Unlock new information about your favourite characters from the Harry Potter movies with this book profiling the good, the bad, and everything in between. Concept art, behind-the-scenes imagery, and film stills track everyone from Harry, Hermione and Ron to Dobby, Mad-Eye Moody and Dolores Umbridge, telling their complete stories as they evolve throughout the film series. A must read for all the Harry Potter fans out there. Zombies: The truth behind history’s terrifying flesh-eaters. Zombies, are they real or some made up story? Only reading Zombies: The truth behind history’s terrifying flesh-eaters, will allow to separate fact from fiction. This book describes ancient history, medieval lore, and modern portrayals of zombies in today’s popular culture. A must read for anyone who is interested in information about zombies… or who wants to prepare for a zombie apocalypse. Paws of Courage: True Tales of Heroic dogs that protect and serve. Inside each courageous canine beats the heart of a hero. Readers will cheer for the hero dogs featured in this collection, profiled with stunning photos and inspiring tales of bravery, friendship, heroism, and devotion. Great for ages 10 years and over. Written by Rudyard Kipling in 1894 (that’s 122 years ago), The Jungle book is a much loved and much read classic story of adventure and survival. The original book was made up of a collection of stories that had first been published in magazines. The tales in the book are fables, using animals to give moral lessons, a bit like Aesop’s Fables. The most famous of The Jungle Book stories are about the adventures of Mowgli, an abandoned “man cub” who is raised by wolves in the Indian jungle. These stories were influenced by Rudyard Kipling’s childhood spent in India and learning the ways of the local jungle. The adventures of Mowgli have been recreated as stand-alone books and movies in the past and these days, when people think of The Jungle Book, they usually think of Mowgli’s adventures. Probably the most well-known was the Disney movie made in 1967. Even though the movie plot isn’t much like the original stories at all, it’s still a great one to watch. But here’s the great news! Disney has been busy making a new version of The Jungle Book, and it’s due to be released in movie theatres on April 21st – right in the middle of the upcoming School Holidays. 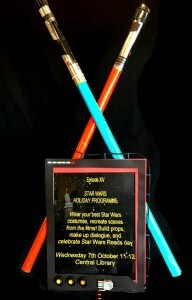 Star Wars holiday activity at Central Library – 7th October at 11am. Attention all Jedis, Bounty Hunters and Rebels!Come on down to the Central Library for Star Wars themed fun these school holidays! Where: Wellington Central Library, Children’s Section. When: Wednesday 7th October, 10.30am. To join in the fun, make sure you come dressed as your favourite Star Wars character. Also check out the trailer of Star Wars : the Force Awakens. See you there and… May the force be with you. This June features Oscar winning Big Hero 6 in the rankings. Love this movie! Baymax and Hiro Hamada adventure around San Fransokyo. But can anything budge My Little Pony from pole position? Throwing down a bit a of a challenge here! Grab some of these hot DVDs for the school holidays.